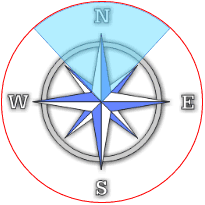 The background image could be, for example, a compass scale, a site map, or a floor map. It is primarily intended to add visualization capabilities to the Panorado JS viewer, but does not depend on it. Place a <canvas> element with a unique id as a placehoder for the element within the <body> element. - Initialize the viewer (see the Panorado JS reference). - Define a viewer.onImageMove function which will update the FOV element's display. - Initialize the PanoradoFOV object and set some of its properties like the URL of the background image. Please have a look at the demo page and its source code! version [get; String] The script's version number. bkImage [set, get; String] The URL of the image to be displayed in the background. The image is always stretched to the full size of the canvas element. ctx [get; Object] The canvas element's display context object. You can set some of the object's visual properties (see below). xCenter [set, get; Num] The distance between the canvas element's left margin and the FOV wedge's center, as a fraction of the canvas width (0..1; default: 0.5). yCenter [set, get; Num] The distance between the canvas element's top margin and the FOV wedge's center, as a fraction of the canvas height (0..1; default: 0.5). radius [set, get; Num] The radius of the FOV 'wedge' (20..x; in pixels). If not set, the FOV will extend to the border of the canvas element. pan [set, get; Num] The cardinal direction of the FOV 'wedge' (0..360; in degrees). Changes are normally triggered by external events like the motion of a viewer. fov [set, get; Num] The width of the FOV 'wedge' (1..120; in degrees). globalAlpha [set, get; Num] The opacity of the FOV 'wedge' above the background (0..1). Note that this doesn't affect the background itself! Use the opacity and background-color styles of the canvas element to control the appearance of the whole element. lineWidth [set, get; Num] The width of the FOV wedge's outline (in pixels). (in CSS notation like '#fff').